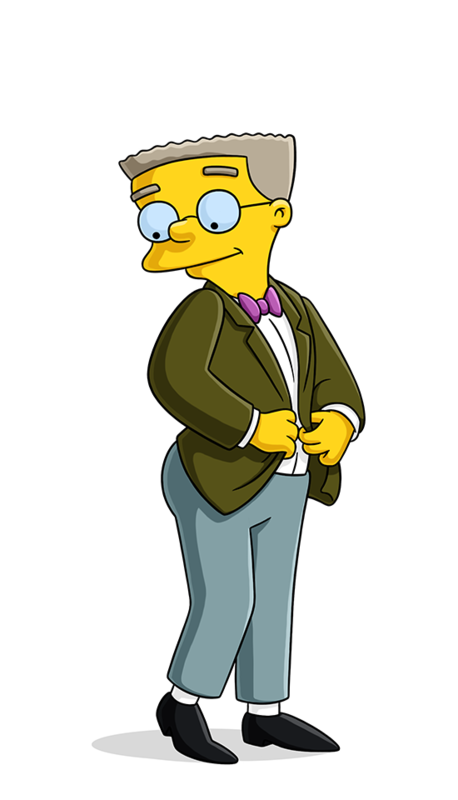 Waylon Smithers. Loyal servant and adamant admirer of Mr. Burns while hoping for nothing in return, and, for the most part, getting it. He tucks Mr. Burns into bed at night, polishes his liver spots, and in the event of a medical emergency, provides him with any needed organs. Owner of world's largest collection of Malibu Stacy dolls. Says, "That's Homer Simpson, sir, from Sector 7G," and "You're a genius, sir." Loyal servant and adamant admirer of Mr. Burns while hoping for nothing in return, and, for the most part, getting it. Tucks Mr. Burns into bed at night, polishes his liver spots, and in the event of a medical emergency, provides him with any needed organs. To be loved by Mr. Burns. Mr. Burns gets kicked out of Moe's Tavern. Smithers is stung by a bee while biking with Mr. Burns. Mr. Buns leads a potato sack race. Smithers convinces Moe to renovate the bar. Homer is trained in Smithers' duties. Mr. Burns and Smithers run the plant together and get chased by robots. Mr. Burns has Smithers exercise for him and can't remember Homer's name. Homer walks around a gay neighborhood and sees Smithers. Burns negotiates with the Nigerian king for uranium. Wanna buy some cookies? Wanna buy some cookies? Listen. What if I helped you turn this bar into a hangout for guys like me?